First thing first. Grab a napkin because you are going to drool. This was amazing! Bacon & Cheese Chicken but that’s not all. This is full flavor, full calorie (fair warning now!) and just amazing. There wasn’t a crumb left in my house. Hubby left the table wanting me to make it again, the girls wanting more. Normally when I make something using a homemade recipe in the recipe I am sharing, I share it all. I use a homemade steak sauce, but you can use any steak sauce. I know this seems like an odd combination in flavors and I am not a big fan of ranch dressing either. 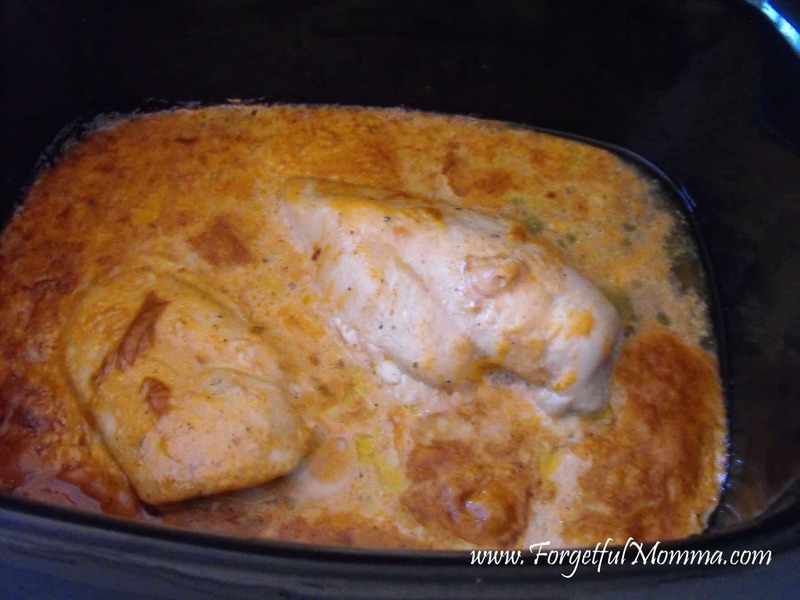 Place your chicken in your slow cooker, try to not layer them. If you layer them, they won’t get as much of the flavor in/on them. Yes, you pour the sauce over the chicken breast, but I’m willing to bet that you figured that much out already. I’m sharing the above picture because I think its pretty, marbled like that. Once your chicken has been cooking for 3-5 hrs on high or 7-8 on low, it looks like that ^. Not so pretty anymore, but smelling amazing! About 15-20 minutes before you are planning to eat, top with cheese, and then some crumbled bacon. I love the Hormel Real Bacon Bits… hubby must always have them on hand. So, are you drooling yet? I know I have been while typing this. 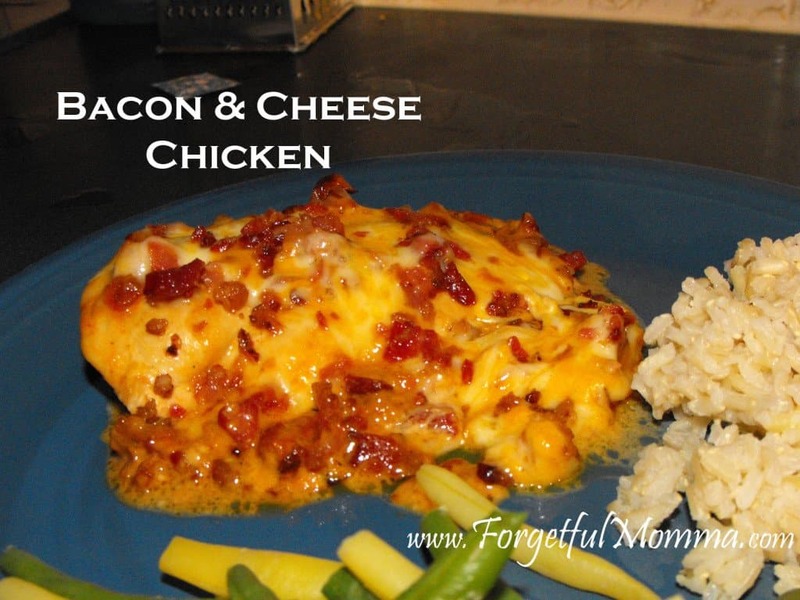 This is Hubby’s favorite meal, as it combines most of his favorite foods: ranch, cheese, bacon. These are not my favorite foods, our of those three I only really like bacon. BUT this chicken is delicious, moist and full of flavor, just don’t enjoy too much of it if you are watching what you eat, or attempting to eat healthier! 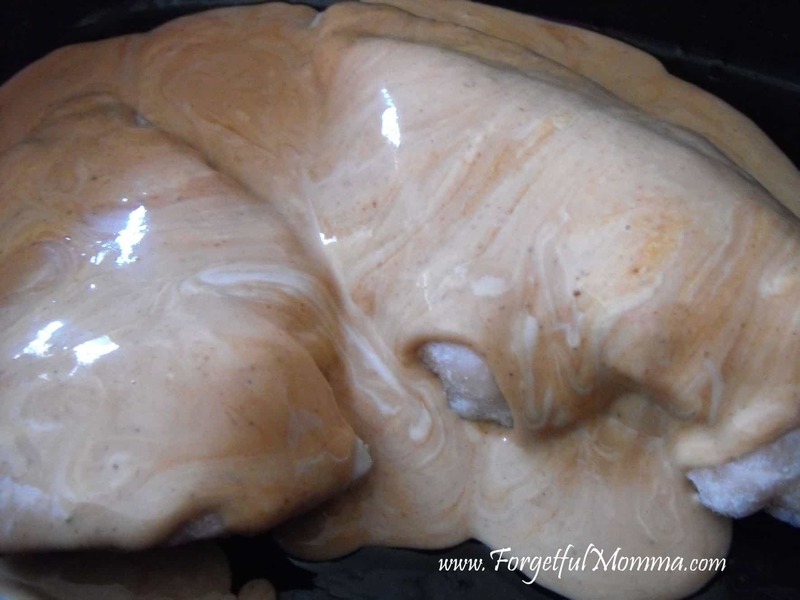 Spread the oil over the bottom of your slow cooker and place the chicken over top of it. 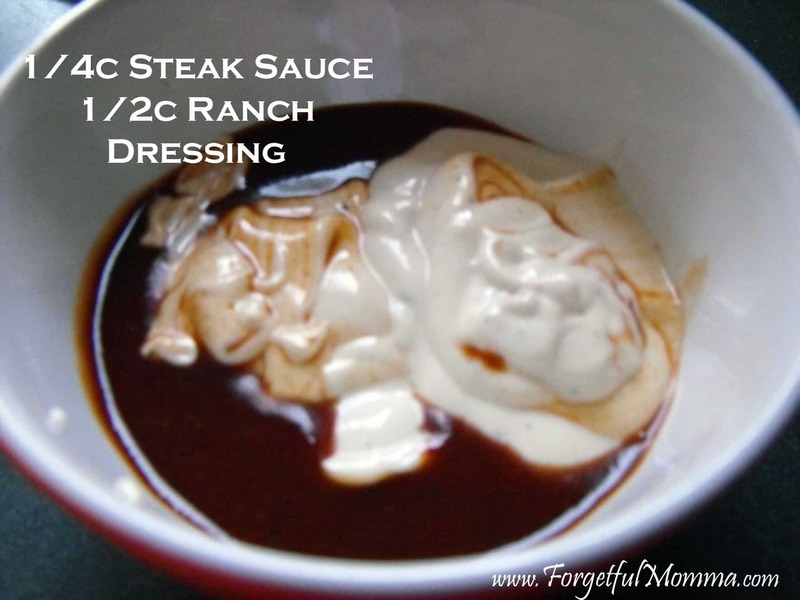 Mix the steak sauce and ranch dressing together in a bowl and pour over chicken. Cook on low 7-8 hours. High 3-4 hours. About 15-20 minutes before serving add cheese to the top of the chicken, and then the bacon. thanks for linking up! your recipe looks yummy!! Bacon is my favorite food group! Looks yummy! Thanks for sharing & for linking up at Motivating Monday at CEO of Me last week! 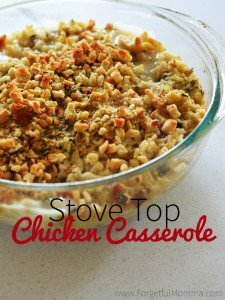 I assume bc of the time that this recipe was done in a Crock Pot/slow cooker? It doesnt mention how the chicken was cooked! I’m betting your times are backward….wouldn’t it be 3-5 on high or 7-8 on low? oops…see where you cuaght it when you get down lower into the recipe…looks GREAT and I will certainly be trying this one…Thanks! Thank you so much for bringing that to my attention! I have now fixed that error. You are correct. 🙂 I really need to watch my proof-reading. Hope you enjoy it as much as we did! This looks so delicious! 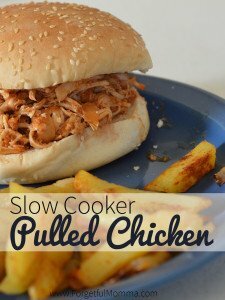 I’m always looking for slow cooker recipes that use ingredients that our whole family loves and your recipe does just that. I can’t wait to try this tomorrow since I have all the ingredients. Thank you! I hope you enjoyed this as much as we did!